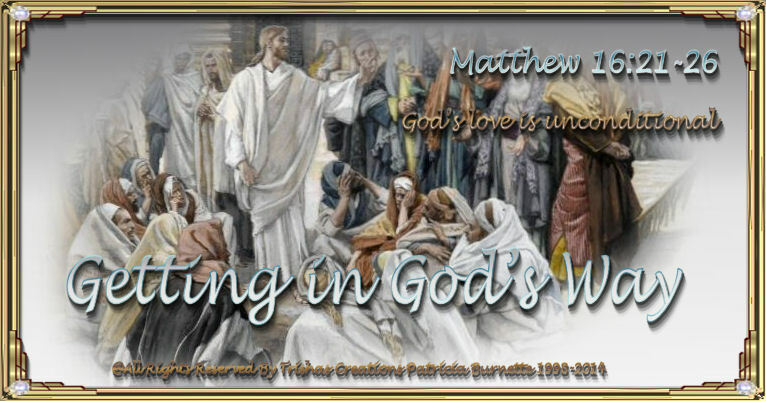 Welcome to "Getting in God’s Way"
God is ever before my eyes. Have you ever tried to help someone, only you do not know the scope of what he is doing? In your willingness, you start what you think should be done. But because you don’t know the desired result, you are actually in the way. Many times, when someone you care about is hurting, you want to help. However, it is not your job to alleviate all hurt and suffering. While you see someone who is hurting, God may see the same person, in the midst of his difficulty, growing in trust and faith in Him. God may be teaching you how to trust Him more, or He may be teaching the person you want to help how to respond to pain and difficulty. There are all sorts of circumstances and situations that people, including you, get in. Your first response is to help. While you may desire to give into this temptation, you should be careful not to do things in your human strength. God’s purpose is greater and farther-reaching than your limited view. The natural tendency is to share our personal experiences and offer our help. Oswald Chamber says, "We have to accept God’s purpose in the providential jumble of things." Do you want to hinder God’s purpose in your life or in the lives of others? Learn to trust God, even when you can’t see the outcome. God’s love is unconditional; how can we ask for more? Jesus told His disciples that He must go to Jerusalem. He explained He would suffer many things and be killed. Peter’s response was "God forbid it, Lord! This shall never happen to You" (Matthew 16:22). Why do we often find ourselves in the position of questioning or interfering with what God is doing? This is what Peter was doing with his protest. God has a divine plan for our lives. From our perspective, we see a problem, but God sees a possibility. He uses all situations, whether they appear unfair or unjust. He often uses things that are painful and hurtful. Naturally, we want to remove the things that cause us pain. However, we can trust God’s providential care, because no situation or problem is outside of His love and sovereignty. We may not understand why or how God is going to do work. Isaiah 55:8 says, "‘For My thoughts are not your thoughts, nor are your ways My ways,’ declares the Lord." Because we often fail to see God’s divine purpose, we do things in our own strength. Our motivation may be sincere, but not necessarily right. If you or someone you love is facing a difficult situation, be careful of the counsel you give or accept. "Many plans are in a man’s heart, but the counsel of the Lord will stand" (Proverbs 19:21).